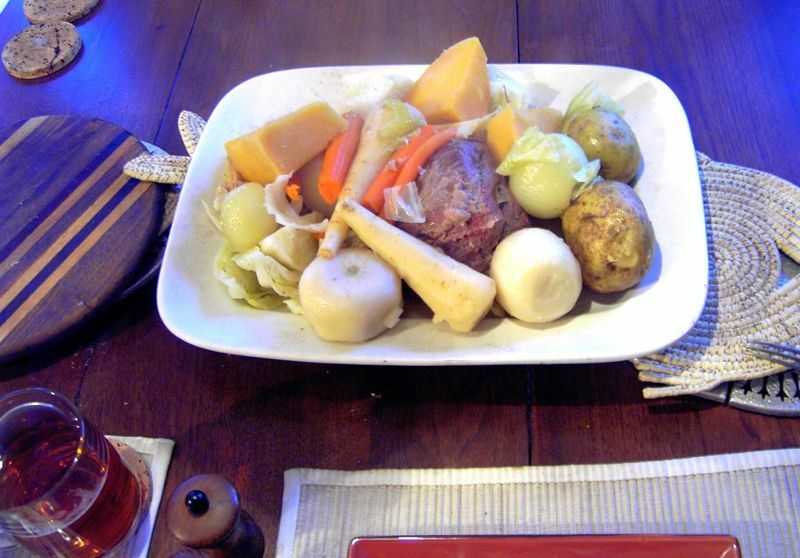 New England boiled dinner is the basis of a traditional New England meal, consisting of corned beef or a smoked "picnic ham" shoulder, with cabbage and added vegetable items, often including potato, rutabaga, parsnip, carrot, white turnip and onion. Left: New England boiled dinner with the above ingredients. When using a beef roast, this meal is often known simply as corned beef and cabbage (see the recipe below) even with the addition of other vegetables. Corned beef is prepared before the actual cooking of the meal by seasoning a cut of beef with salt (large grains of salt were known as corns) and spices and the natural meat juices. This meat is then placed whole, like a rump or pot roast (beef) into a crock pot, which in olden times was a ceramic pot over a fire, filled with cabbage and carrots, and, when available, red potatoes. Rutabaga or turnips are also common ingredients. This meal can be left in a crock pot all day but must be kept in the naturally humid environment of cooking meat. Corned beef and cabbage is often served as a whole meal. Smoked shoulder is an exceptionally salty cut of meat. Two different methods of preparation are commonly used to decrease the amount of salt in the meat. In the first method, the meat is placed in a pot and soaked in a refrigerated cold water bath for one day prior to cooking. During the soak, the water is changed several times. The pot of meat and water is then boiled on the stovetop until the meat is tender. In the second method, the meat is placed in cold water and brought to a boil. The boiling water is then poured off, replaced with fresh cold water, and the ham is brought to a boil again. This process can be repeated several times, as deemed appropriate by the chef, before the meat is allowed to cook. A combination of both methods is also acceptable. This is a very easy meal to cook, as the salt and flavor of the meat require no additional seasonings. The ham generally must boil for several hours until it is ready to eat. The vegetables are placed in the pot and boiled with the meat; however, some chefs prefer to place them in the ham's water after the meat has been removed to avoid overcooking. Common condiments include horseradish, mustard, and vinegar. *Brisket should be prepared through the brining stage, but not cooked.